House Dres, age-old masters of Morrowind’s slave trade, are not what they once were. Revolts, wars and the devastating eruption of Red Mountain have left the once mighty House a shadow of its former self. Many believe it to be broken, its members dead or cowering in exile. These rumors are wrong. A strange settlement has been established in the ash wastes of Solstheim. Khajiit and Argonians are disappearing, and once more the specter of slavery looms in the dark corners of Tamriel. Will you stand in the way of House Dres’ return, or will you join them in their schemes? Choose wisely, for some chains are not easily broken. [*]A new settlement to the east of Raven Rock in Solstheim. [*]A fully voiced, lore-friendly quest with multiple choices and endings, professionally written by author Joseph Russell[/url] (nexus profile﻿). [*]New weapons, armors and an in-game book. [*]Two new types of Khajiit and Argonians – the Suthay-raht and the Wasseek-haleel – encountered as slaves of House Dres. [*]A new creature – the Nix Hound – brought by House Dres from their homeland of Morrowind. 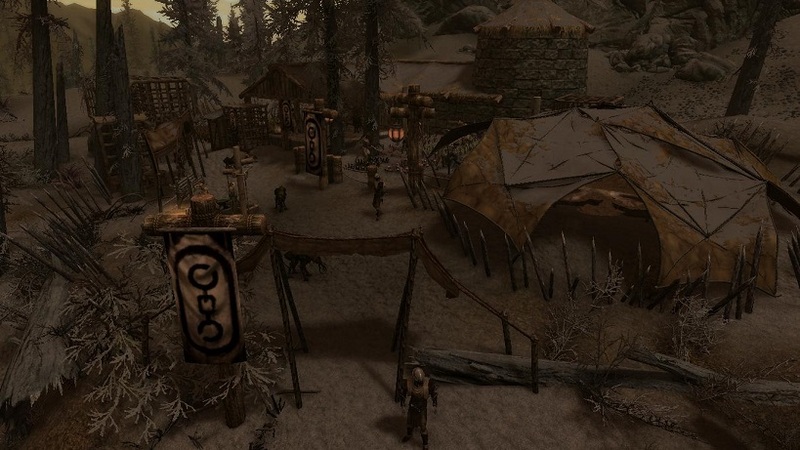 House Dres has returned to Solstheim and established a settlement to the east of Raven Rock. Their slave trade is blossoming once again, and it is up to you whether they succeed or fail. To start the quest, speak to the J’kidar, a strange-looking Khajiit in the Retching Netch, in Raven Rock. He’s looking to hire some help, and chances are, you’re just the kind of adventurer he’s looking for. The House Dres Settlement will then be added to your map – though if you stumble across it accidentally, the quest will adapt to that scenario instead. Though the quest is relatively short, it has a number of branches to suit a variety of playstyles, and there are several different ways to resolve the situation with the slavers, some more violent than others. Be warned, however – House Dres won’t take kindly to you sneaking into their settlement uninvited, so if you’re determined to barge your way in without talking to the guard, be prepared for a fight. Watch out for the Nix Hounds, too. Savagely loyal to their Dunmer masters, these green beasts will make mincemeat of you if you let them get too close. Good luck, and may Azura bless you with the wisdom to make the right choice. Read the prequel short story here! [*]The NPCs in the mod may not talk to you when you first encounter them. This is a vanilla bug, and may be fixed by saving the game while in sight of the NPCs in question and reloading. It is easiest to download and install the mod using Nexus Mod Manager. If you want to do it manually, unpack the zip into your game directory’s “Data” folder, but be careful not to miss anything! We are more than happy for anyone who would like to translate this mod into another language to do so! Just drop me or Joseph﻿ a PM so we know you’re planning on making one and we’ll almost certainly give you the all clear – so long as the file you upload is simply an esp replacer, and downloading this original mod is still required. Please note that we cannot provide support for translations. There are currently no known incompatibilities with this mod. This mod is Part 1 of the in-development House Dres Operations saga. House Dres Operations pt.2 will be titled “The An-Xileel Arrival”.